The National Rugby League is an Australian-based competition that is hugely popular with punters of the oval ball variety. There are up to eight games played each week from Thursday to Monday with extensive markets available on every game of the season. Considered one of the toughest leagues in the world, the NRL is known for its evenness in competition, making betting on the NRL worthwhile for the entire season. There are no pointless games and with such an exciting format, it makes it an interesting spectacle for punters. Bettors around the world are starting to realise the power of betting on Australian sport and the NRL tops the list when it comes to value betting. There may be two prominent rugby codes in Australia, but for the majority of the country – there is really only one. The National Rugby League has been the dominant rugby code in this country since its inception, and for a large portion of the country it is the premiere ball sport. It has not always been this way for Rugby League in this country. The Super-League battle of the mid-90s threatened to derail the entire sport, but thankfully the code overcame legal troubles to unify the sport. Now, the NRL has teams in NSW, the ACT, Victoria and even New Zealand; highlighting just how national – and international – the sport really is. The game is healthier than ever, but you did open this article to read about how great the NRL is – you already know that. You came here to read about how to invest your hard earned cash on the National Rugby League, and thankfully you have visited the right page. This article will run you through your betting options, present you with some fantastic and fun facts and show you the best places to wager on the NRL. Rugby League World Cup future bet: This article may be for the NRL, but that does not mean we are excluding the Rugby League World Cup. A Rugby League future bet is as simple as selecting the country you think will win the World Cup. Futures markets are available years in advance of the tournament taking place. National Rugby League futures markets: Similar to the Rugby League World Cup futures market, the NRL futures market is selecting the team you think will win the title. Odds are available all throughout the season and fluctuate depending how the teams fare throughout the campaign. Dally M betting markets: The Dally M medal is awarded to the best player in the National Rugby League throughout the regular season, and thankfully any bookmaker worth their salt will have serious markets on the medal. 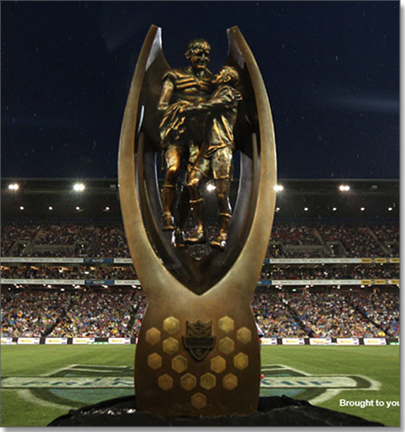 A Dally M bet can be placed as a futures bet at the beginning of the season, or can be placed as the season progresses. Clive Churchill Medal: Think you have an idea who will be awarded the Clive Churchill medal for best afield in the NRL Grand Final? Well, all the good bookmakers will allow you to place some coin on the outcome. This can be placed at the start of the season or throughout, but as teams are eliminated from contention as are players that can compete for the medal, meaning players odds will shorten significantly. Head-to-head markets: Head-to-head betting is as easy as picking the team you think will win in a particular match. Line betting markets: Similar to head-to-head betting, line betting is choosing a particular team to win, but you are offered a bigger or lesser money return depending on whether your team gets a points head start or a deduction. For example, the Rabbitohs could go into a match against the Bulldogs as the $3.30 outsiders, but if you were to bet on them at the line, you could get $1.92 with a +5.5 line, meaning they can lose by five points or less or win and you will get a winning dividend. Margin markets: The margin betting market is elementary. All you need to do is pick the team you think will win and the margin in which they will do it. The difficult part is selecting just how wide your margin for error will be. A margin bet can be an exact result, a five point gap or just to win by under or over a certain amount. Total score markets: The total score market is placing a bet on the total amount of points you think both teams will put up in a particular match. The bookmaker sets the amount they believe will be scored and you can choose to bet on that amount being exceeded (over) or not being matched (under). First try scorer markets: The first try scorer market is as easy as placing money on the player you think will score the first major of the match. This bet can be placed as either the first try scorer for the match or the first player to score one for their respective team. There are plenty of only bookmakers that claim to be in it for the punters, but can anyone really believe them? Thankfully our team has gone through the bookies with a fine tooth comb and selected the best-of-the-best when it comes to investing your hard earned. When it comes to punting on the National Rugby League, it would be prudent of you to check out one of our favourites, Sportsbet.com.au. Sportsbet has futures markets on the League before the current season is completed, comprehensive odds on all the regular season games and specials throughout the year, as well as all the World Cup markets you could ask for. English betting giant, WilliamHill.com.au is the place all the punters are raving about, and with good cause. William Hill has all the futures markets, comprehensive game markets and terrific in-play betting which allows punters to track the games play-by-play, William Hill has the serious punters covered. If you enjoy betting on American sports but find the consistent stoppages in play hard to handle, betting on the NRL provides punters with not only one of the best professional leagues in the world, but also a game where the play is continuos and tough. You just need to look at the remarkable transformation of NRL superstar Jarryd Hayne to a NFL player. The game lasts 80 minutes, but the clock stops only for serious injuries and the 10-minute half-time break. Punters want their bet resulted sooner rather than later, and betting on the NRL provides a quick and exciting payout opportunity. 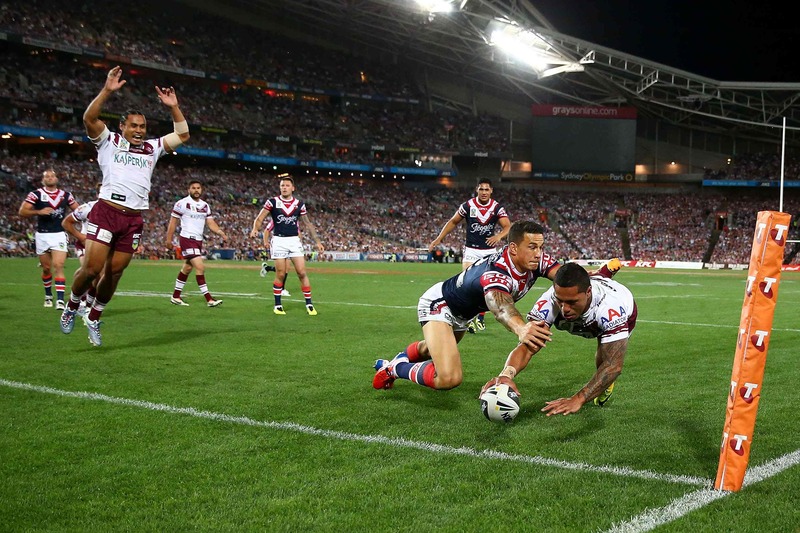 With over 80 betting options to choose from on every game, betting the NRL is a profitable investment for gamblers that enjoy getting the best value out of sports betting. Placing a bet on the NRL is much like any other sport around the world, but it can be difficult for new punters who don’t fully understand the sport. With so many games being played throughout the week, following the season can be tough, but our bookmakers provide updated futures odds for the NRL Premiership which makes it easier to follow which teams are going well and which teams are best to avoid. Betting on the NRL can be as simple as picking the winner of the game to as difficult as predicting which player will score the first try. Both require having some knowledge of the game and as the season progresses, punters get a better feel of what rugby league is like. Premiership betting: By and large the most popular betting market on the NRL is who will win the premiership. The tightness of the competition might mean four or five teams are close to favouritism and odds can fluctuate dramatically throughout the season. Look for swings in form or even bet before the season to get the best odds on a team you fancy. Head-to-head betting: Just like any other sport, bettors must select the winner of the game after 80 minutes and it includes overtime (one five-minute period of extra time). If both teams are still tied after extra time, the bet return will be halved, but head-to-head betting remains one of the most popular betting options in the NRL. Due to the high level of competition between the teams, the H2H markets offer good odds in comparison to other sports. Points spread: NRL point spreads are very similar to NFL. A try (equivalent to a touchdown) is worth four points and a conversion (extra point) is worth two points. A converted try is worth a complete tally of six points and that has an impact on the points spread markets. Teams favoured to win by a converted try will be represented by -5.5 (+100) in the market. The points spread lines can differentiate to any number, but it’s rare to see any number above 30. Later in the season when a top team is playing a team with a poor record, the points spread line can move out to a big number. Bettors of the NRL can find good value betting on home underdogs getting a handy points spread. Total combined points: A simple betting option of deciding if the total amount of points will go under or over the total set by bookmakers. NRL games can either be low scoring or high scoring, but they typically range from 40-50 points. Bookmakers will typically set the total between these numbers for most NRL games, depending on form of the teams and expected weather. Bettors can parlay total combined points options with head-to-head bets. Every bettor loves an exotic bet from time-to-time and there are a range of exotic options available for NRL enthusiasts. Exotic betting appeals to both casual and serious punters and NRL betting caters to both levels. The most popular option is the ‘first try scorer’ market. Every player is listed in the market with the more likely players at much shorter odds. The best players to select are backs and more importantly the wingers – which are noted try scorers in the NRL. Of course, you can choose a big forward who has scored only one try in 10 seasons, but that’s what makes betting on this option fun and profitable. Apart from in-game exotic options, the NRL encompasses other competitions which you can bet on. State of Origin, NRL Nines and the All Star Game are all available to bet on throughout the season and all three have become very popular options. Our bookmakers provide ‘specials’ throughout the season on certain teams and players. Which team/s will make the playoffs, leading pointscorer, most losses. You name it, our bookmakers will offer it. Bettors can also parlay (multi) any options from game-to-game in the NRL. Bookmakers often provide good deals for parlay bettors so this can be a rewarding and profitable betting strategy. But you need to keep in mind that you can usually only choose one leg from each event. So you can’t parlay Canterbury to beat Brisbane and then include Canterbury to cover the spread. The new season kicks off in 2016 where all 16 NRL teams will be battling it out for the premiership. 2015 winners North Queensland Cowboys are on the third line of betting with beaten grand finalists Brisbane the top elect with bookmakers. The only franchise not to be located in Australia, the New Zealand Warriors, have also been well favoured after a number of off-season signings. * View most recent premiership market at www.Sportsbet.com.au. The Dally M Medal awards the best player of the season. This is held before the playoffs and is based on a points system from each game. Past winners include NFL convert Jarryd Hayne, Daly Cherry-Evans and multiple winner Johnathan Thurston. Full market available at www.Crownbet.com.au. The above table is geo-targeted to your location. This means it will only display bookies available to people in your place of origin. Most bookies around the world will offer betting on Australian sports – simply because Aussies bet so much with “offshore” bookies, but for those of us in other countries it provides an opportunity to bet on the premier league in the world. Residents of the UK and New Zealand have a particular interest in the NRL with players from their national teams often playing in this competition. Many of the bookies operating in the UK also have an Australian arm of their company. As an example www.WilliamHill.com is a UK company, but is fully licensed and regulated in Australia, but also offer the same NRL markets to customers in their home country. If you are in the USA BetOnline and 5Dimes both over betting on the NRL, although their options are limited in comparison to other online bookies.